"I was born in a little town outside of Chicago next to a steel mill, in East Chicago in 1932. As far as I was concerned I invented tattooing. I had to invent it because nobody showed me now to do it. The Encyclopedia Britannia was of minimal help. I only did one design (on myself), at one time and it was quite small (a butterfly). It was somewhere in my mid teens, fifteen or something like that". "I went to Indiana University and studied art. I did a little bit of commercial art, art studio kind of work, freelance art, etc. I wanted to learn tattooing. I got to know Phil Sparrow, learned tattooing and started tattooing in Chicago. I opened a little shop in Chicago (Old Town Tattoo Studio, 1953 North Larrabee) in the mid 1960's". "Actually my first tattoo joint wasn't even the Old Town one. It was a weekend gig at Chanute Field at Rantoul IL. It was sort of an arcade/hamburger joint that always had a place for a tattoo artist. They needed one and got in touch with Milton Zeis in Rockford IL. and asked him if he knew anybody that might like to do it. So Milton gave them my name. I bought supplies from Milton Zeis". "I believe it true that in the 1950's many shops (in Chicago) were connected with the Mafia. I don't know to what extent it was true. I know that Phil Sparrow was not connected with the Mafia. It was considered a little bit as a act of defiance. I think it caused him no grief, and I am sure that when the age changed to 21 (1962) any interest they might have had, if they did, was quickly lost. They were in all sort of small business, but I have no hard knowledge and those that knew, I never ask. By the time I got into it they were not interested". 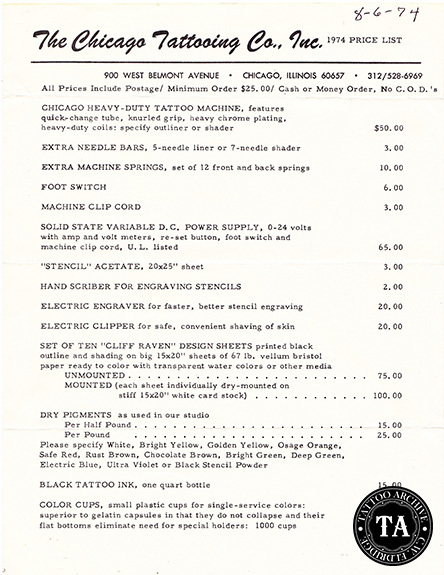 "The Chicago Tattoo Supply was started on Larabee Street and operated later on Belmont. We had a decent machine, the old Owen Jensen round hole machine. We did a sand casting of that; it was a nice machine. I worked with versions of that most of my later career. I always liked it, it suited me, it was nice and heavy. I always said in those days if you work with a heavy machine now, later when you can't, you can work with a lighter machine". "One of the things that motivated us at that point, or certainly kept us motivated, was the attempt to stay away from mercuric sulfide red. We tried to formulate a red, or mix a red that would function well as a red and would not be allergenic to anybody. We called it safe red". 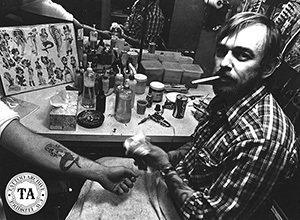 "There was a period around the first convention in 1976 when a great deal of resentment (existed) on the part of the tattoo artist at the hyper availability of tattoo supplies. There were three of us (supply companies) there, Spaulding, Crazy Eddie, Buddy McFall, Dale and myself from CTS. Two of the parties made an attempt to get the third party to make an agreement not to widely disseminate tattoo equipment, and the third party refused. You can fill in the blanks". Learn more about Cliff Raven in The Life & Times: Cliff Raven in our online store.